(Nanowerk Spotlight) The market for transparent electrodes has grown tremendously due to wide proliferation of LCD displays, touch screens, thin-film solar cells, and light emitting devices. The most widely used material today is indium tin oxide (ITO) with a market share of more than 97% of transparent conducting coatings. ITO coatings have some major drawbacks, though, and many efforts to find alternatives are based on nanomaterials – metal nanoparticles, metal nanowires, carbon nanotubes, and graphene – which can be printed directly on various substrates without etching processes. Researchers have now developed a simple high-throughput, one-pot procedure to prepare a series of nanocrystal inks that makes it a very attractive fabrication process for applications in a wide range of all-solution-processed, flexible, stretchable, and wearable optoelectronic devices. "Our finding advances the field of nanocrystal inks in two aspects," Professor Haibo Zeng, Director of the Institute of Optoelectronics & Nanomaterials at Nanjing University of Science and Technology, tells Nanowerk. "Firstly, through simply heating a mixture of metal-organic precursors, we synthesized a wide range of transparent conducting oxide nanocrystal (TCO NC) inks, which can be assembled into high-performance electrodes. The formed nanocrystals are of high crystallinity, uniform morphology, monodispersity, and high ink stability and feature effective doping." "Secondly" he adds, "the inks can be readily assembled into films with a surface roughness of 1.6 nm. Typically, a sheet resistance of 110 Ω/sq can be achieved with a transmittance of 88%, which is the best performance for TCO NC ink-based electrodes described to date." As Zeng and his team report in Angewandte Chemie International Edition ("A General One-Pot Strategy for the Synthesis of High-Performance Transparent-Conducting-Oxide Nanocrystal Inks for All-Solution-Processed Devices"), these electrodes can drive a polymer light-emitting diode (PLED) with a luminance of 2200 cdm-2 at 100 mA cm-2. "In contrast to the previously reported TCO NC synthesis method, we demonstrate a facile and universal one-pot method for the synthesis of a wide range of TCO NC inks and the corresponding electrodes for all-solution-processed devices with good performances," Jizhong Song, a postdoc researcher in Zeng's group and the paper's first author, points out. 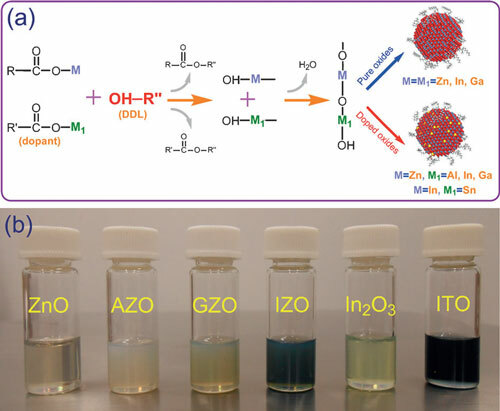 The approach proposed by the team is generic for various transparent conducting oxides as well as other oxides (e.g., CoO, MnO, Fe3O4, CdO) nanocrystal inks. The one-pot process can be easily scaled up to 10 g. The resulting TCO NCs are highly crystalline, with a uniform morphology and a narrow size distribution, as well as an effective doping control and a high colloidal stability over one year, making them suitable to be used as inks to print smooth, crack-free, highly transparent, and conductive films. TCO NC inks are compatible with flexible and stretchable substrates, which can be simply prepared by solution-based techniques, such as spin coating, ink-jet printing, spraying, and roll-to-roll production. In recent years, the hot-injection method has become very popular for the synthesis of monodisperse colloidal nanocrystals, which have been used to prepare ITO and GZO (ZnO doped with gallium) nanocrystal inks. "These processes involve a chemical reaction between the injected sources and the mother solution and suffers from two disadvantages," explains Song. "First, a small dose of injection is usually chosen to achieve high-quality doping, but this injection mode leads to a low throughput and is difficult to scale-up. Second, the doping quality is very sensitive to the dopant element and the injection parameters. All of the parameters have to be changed to prepare oxide NC inks with different dopants." The developed one-pot process thus offers an universal strategy for the fabrication of a wide range of TCO NC inks. Zeng notes that, in order to use this process in future transparent conductive electrode applications for flexible and stretchable optoelectronics, the main problem is how to make it compatible with current industrial solution-based processes such as roll-to-roll and blade coating production. In addition, the electrical properties of TCO NC electrode must be further improved by short ligand exchanges or optimal post-treatments, which can meet the requirements for practical application.